Well, our house is literally falling apart around us. After the washer going on the fritz a couple weeks ago, now our A/C is acting up. Just another opportunity to save a few hundred dollars in the Steen household. Basically the fan inside was just blowing warm air. My limited knowledge of A/C systems pointed me towards the outdoor compressor unit (a Carrier CA16NA036). When I went out there, is was just making a faint buzzing noise and the fan was not spinning. I am no HVAC expert but that seemed wrong. A quick Google/YouTube search (are you noticing the pattern yet) revealed that the first test is the pencil test. Simply put, you try to kick start the fan by manually getting it started. Turns out that there is a capacitor on the unit the takes care of getting the fan started so if that goes back, the unit will still run after given a manual assist. Luckily I had some car tools that fit between the grate and after one kick start, the fan started right up. This narrowed my problem down to the capacitor, which go for a whopping $11 on Amazon. Too bad that didn't fix the problem, the air was still blowing warm. 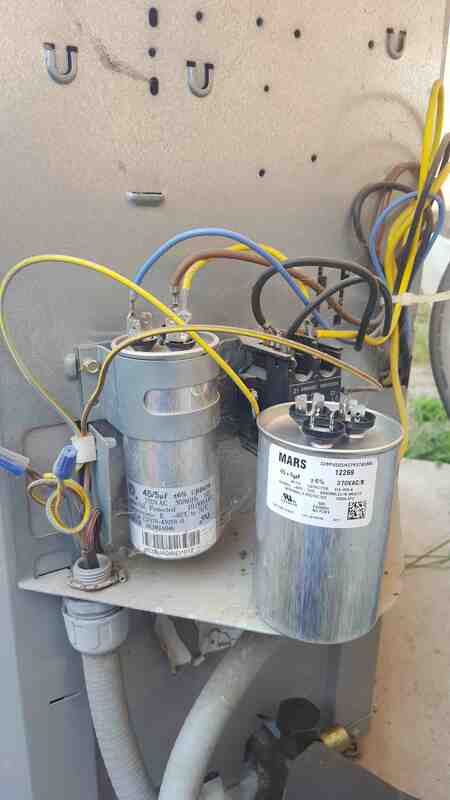 Adding to my HVAC knowledge bucket, new units have a dual run capacitor that give a start assist to both the fan (as I learned) but also the compressor. But at least I was confident that it was the capacitor. Some of this research happened at work, so when I was ready to order the part I did not know what rating of capacitor to order so I asked my wife to go out and take the panel off to check. Like a BOSS she got out there and did it (she removed 8 of the required 4 screws). With the rating info, I found the part I needed on Amazon, installed it, and we have been cold and frosty ever since. Here is the Amazon part next to the incorrectly sized part I got from a local supplier. This is the part from Amazon. I originally went to a local A/C parts supplier but the capacitor they had did not fit in the mounting bracket AND they wanted $40. I had to call a couple suppliers as most would not sell A/C parts to the general public. Appliance repair is such a racket.